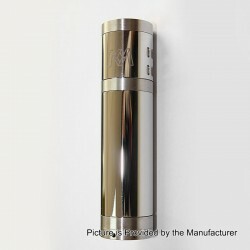 The SXK Poldiac V2 Mechanical Mod Clone is constructed from stainless steel in 22mm diameter. The contacts in both the 510 connector and battery tube are adjustable, so your atomizer will sit flush with the top cap and your battery will not rattle. There are 8 air holes on the bottom cap to prevent the battery from over heat. The mod is powered by 1 x 18500 battery (not included) and comes with spring fire button.